Hokulea returned to the Pacific Ocean for the first time in two years after getting towed through the Panama Canal. The crew is now sailing towards the Galapagos Islands. Hokulea crew member and documenter Naalehu Anthony and Miki Tomita, the Director of Polynesian Voyaging Society's Learning Center, appeared on Sunrise to talk about the event and share their experience aboard the canoe. (PACIFIC OCEAN) - Iconic Polynesian voyaging replica Hokulea yesterday departed Balboa, Panama and began her sail to the Galapagos Islands. 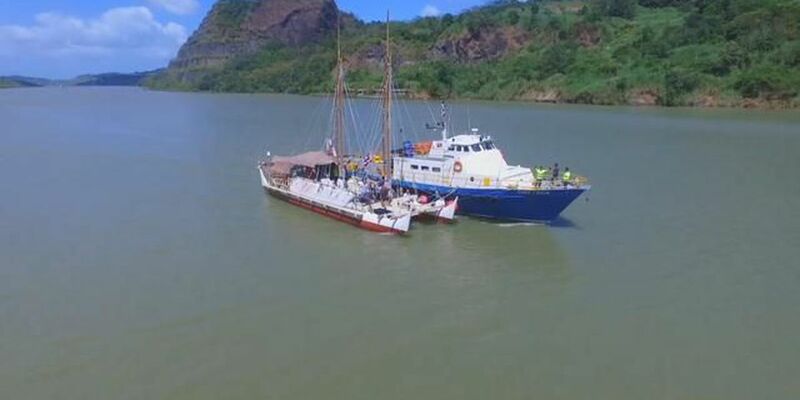 After making a momentous crossing of the Panama Canal, crews spent several days engaging in a cross-cultural engagement with indigenous groups and sharing the meaning of the Malama Honua Worldwide Voyage sponsored by Hawaiian Airlines. Hokulea's voyage to the Galapagos will take approximately 10 days. "Hokulea is back in Pacific waters after nearly two years and the Galapagos will be the first Pacific islands we will visit on this journey home," said Nainoa Thompson, president of Polynesian Voyaging Society. "The Galapagos Islands will be an important mission stop where we will celebrate their sustainability efforts, identify parallels with Hawaii and bring attention to science, evolution and protecting the earth's most fragile natural resources," added Thompson. A contingent of students and teachers from Castle High School, Kamehameha Schools and Halau Ku Mana will be traveling to the Galapagos to work with the crew of Hokulea. Students will join the crew members on their engagements and take part on an unparalleled educational journey in this UNESCO World Heritage Marine site. Hokulea will stay approximately in the Galapagos for approximately one week before setting sail for Rapa Nui.